If you haven’t heard about “chop’n’drop” you can probably work out roughly what it means i.e. when pruning shrubs, trees or pretty much any plant, just leave the prunings on the ground. Much of the modern writing about this has arisen from within permaculture and has been strongly supportive of this approach. Let’s examine the pros and cons to work out whether it is right for your garden. Actually chop’n’drop is a very old practice, variously called “cut and drop” or “slash and mulch”, carried out in most ancient farming cultures and still today in traditional cultures in central America. After rain, seeds for the next crop are sown under other plants, such as sunflowers, which are then chopped and left on the ground1. The chopped plant, such as the lucerne in the image above, act as mulch and the seeds for the next crop germinate underneath it. 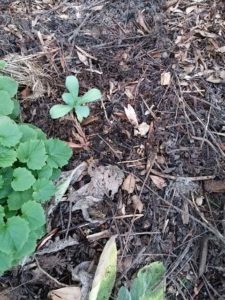 This is what you also see in natural ecosystems where leaf fall produces mulch and adds nutrients for seeds which have already fallen to germinate and grow. Modern agriculture heralded use of mechanical methods (which may have initially just been wooden ploughs) to till the soil and introduced the use of expensive chemical herbicides and fertilisers. This approach carried over into gardening. However, such methods resulted in soil degradation and fertility loss. This outcome has stimulated many to look again at traditional techniques for obtaining fertility in an effort to reduce damage to the soil and the broader environment. So should we to chop or prune any vegetation that is not wanted for some reason and leave it on the soil surface rather than putting it in the Council green bin or into a compost heap? Humans have had a rather short time on the planet so we would do well to adopt nature’s methods which have been around much longer – maybe with a little wise tweaking. Trying to out-do nature, as mentioned above, has had undesirable consequences. The use of green manures is a version of chop’n’drop, but the green manure crop is usually dug into the soil. It is recommended that such crops are nitrogen-fixing legumes, but others, such as buckwheat, which grow quite quickly, still provide useful additions of organic matter, although not so rich in nitrogen. 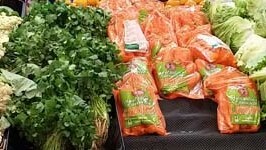 In either case, microorganisms break down the organic material for use by subsequent plantings. If the “manure” crop is just left on the soil surface in chop’n’drop it will also break down and allow nutrient recycling in a reasonable time AS LONG AS it remains wet to facilitate decomposition. However, chop’n’drop has wider application than green manures. Particularly useful plants for this purpose include the legume lucerne with quite deep roots which can access nutrients deep in the soil. Since it is perennial and grows quickly it can be chopped up to 5 times per year. It is also quite attractive with small fine leaves and purple flowers. Just letting such chopped material lie on the soil surface will allow about half its nitrogen content to enter the soil within 4 months – most of it will be incorporated in 17 months2. It is probably easiest to grow plants that you plan to chop near where you need extra fertility. For example, grow lucerne or comfrey close to fruit trees. But you can also grow plants where soil enrichment is not required e.g. up the back or along fence lines and then add the prunings where you need them. It is best that they are nitrogen fixers. You don’t need to be limited to soft leaved plants; acacias also fix nitrogen and, if the right species are chosen, you can grow them to give the extra benefits of acting as a windbreak and providing nectar and shelter for small native birds. Woody branches should probably be buried to favour their decomposition. Hugelkultur, which developed in Europe, involves just this method, covering piles of wood with soil and growing plants on top. 3,4 As microorganisms decompose the branches, soil fertility increases. Particularly where rainfall is low, fresh organic material on the soil surface will stop water run-off, reduce evaporation and retain moisture in the soil5. It also reduces diurnal temperature variation and reduces heating in summer. In heavy rainfall areas, the presence of organic material on the soil surface will break the force of rain and moderate downhill flow and so reduce soil damage. If plants like lucerne, lavender, chives and comfrey are chopped after their first flowering, they regrow and flower again extending the time nectar is available to bees. This is an attractive feature to home gardeners who may be rushed for time. Chop’n’drop saves carting material to a compost heap, which needs turning, or to the green council bin. In addition to saving physical effort of moving prunings, chop’n’drop means you are growing your own mulch and compost, so you won’t need to buy them in. Commercially made compost incorporates the mileage of transporting materials from green bins to composting sites then on to garden centres and then to your garden (often in plastic bags). So chop’n’drop saves pollution from transportation and material manufacture. Depending on your point of view, you may think that having parts of your garden look like the picture on the right is too messy. You will need to decide how neat you want the garden to look or if productivity and resource conservation are more important. If you chop’n’drop nitrogen-poor material there may be some depletion – but mainly right at the interface between plant material and soil surface. It shouldn’t be an issue if leguminous material is used. Those annoying creatures may love the layers of moist green matter. But there are usually other attractive places in the garden where they hide. Dropping diseased plant material on the soil is not a good idea – just like it’s not a good idea to put it in your compost heap. Plants which grow readily from seed could colonise your whole garden if they are chopped after they have gone to seed. But slashing them just as they flower will avoid this. In fact, it is a good way of getting rid of weeds which propagate by seed and making use of them at the same time. In hot, dry weather this may be an issue unless the plant material is well watered or is chopped just before rain. You will still need to employ a vermin-proof composting method or worm farm to recycle food waste. If insufficient moisture is available this can be an issue. However, many sub-optimal home compost heaps with the wrong C:N ratios take a long while to decompose too because they never heat up sufficiently. 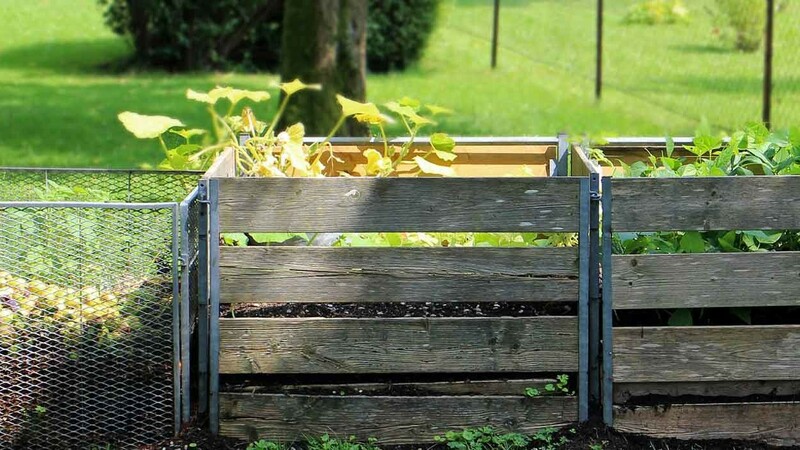 Moreover, nutrients leaching from compost heaps only benefit the soil under them. So will you chop’n’drop or not? Derpsch R. 2004. History of Crop Production,With & Without Tillage. Leading Edge 150. Shengzuo Fang, Baodong Xie, Huanchao Zhang. 2007. Nitrogen dynamics and mineralization in degraded agricultural soil mulched with fresh grass. Plant and Soil 300, 269. Nichols T. 2010. Don’t Burn It – Hoogle It! Warm Earth 92, 22. A.M O’Connell AM, Grove TS, Mendham DS, Rance SJ. 2004. Impact of harvest residue management on soil nitrogen dynamics in Eucalyptus globulus plantations in south western Australia. Soil Biology and Biochemistry 36, 39.